For Shannon – I’m sorry to hear about your grandfather. 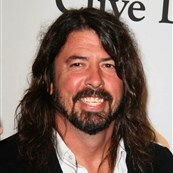 As requested, here’s Dave Grohl. My condolences to you and your family. Take care of each other the way he took are of all of you. And for Beca who said goodbye to Critter. I know you’ve lost your best friend but, remember, for 18 years, this was the relationship you never, ever had to doubt. That kind of love will never go away.